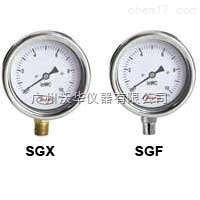 Wetted Materials: SGX: Brass; SGF: 316/316L SS. Accuracy: ±1.6% FS on positive pressure ranges 15 in w.c. & greater; ±2.5% FS on all other ranges. Pressure Limits: Full scale value. Temperature Limits: Ambient: -13 to 149°F (-25 to 65°C); Process: 212°F (100°C) max. Enclosure Rating: NEMA 3 (IP54). Weight: 4.6 oz (0.13 kg).